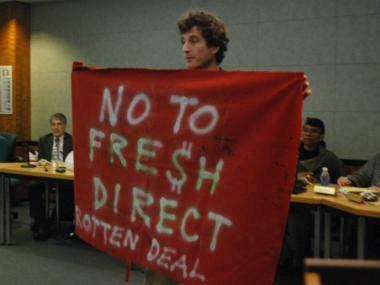 Rob Konrad, a critic of the FreshDirect deal, holds up a sign at a public hearing on the FreshDirect subsidy deal in February 2012. On June 13, several South Bronx groups filed a lawsuit against the company. BRONX SUPREME COURT — In their latest bid to block FreshDirect’s publicly subsidized move to The Bronx, several community groups filed a lawsuit against the company Wednesday claiming it failed to study the full impact its new facilities would have on the area. The suit claims that the grocery delivery company relied on an outdated study from 1993 that analyzed a different project at the site where it plans to build its new facilities. The suit says the new buildings will harm the community in ways the old study could not have anticipated. “This is a classic environmental justice case,” said Christina Giorgio, staff attorney at New York Lawyers for the Public Interest, which is representing at least four Bronx community groups. FreshDirect recently commissioned an environmental assessment of its planned move from Queens to the Harlem River Yard in Port Morris. The city’s Industrial Development Agency exempted it from conducting a more thorough impact analysis, allowing it instead to rely on the 1993 study, according to the suit. But that 19-year-old analysis is inadequate, the suit claims, because it occurred before recent environmental laws were enacted and it considered the impact of trains, not delivery trucks, on a neighborhood that has changed dramatically since the early 90s. She noted, for instance, that the neighborhood surrounding the Harlem River Yard site was rezoned in the late 90s, which spurred the construction of some 700 residential units and attracted many small businesses and artists to the area. Last year, a 12-story, 419-unit housing complex, called Bruckner by the Bridge, was built on land adjacent to FreshDirect’s planned 500,000-square-foot facility. Since the city and state announced in February a nearly $130 million subsidy to help FreshDirect relocate to The Bronx, some South Bronx residents have tried to stop the move, which they say will restrict waterfront access and worsen the local air quality. The suit, which names city and state agencies along with FreshDirect, also says that the defendants neglected to hold a public hearing or visit the local community board before announcing the subsidy deal. The city’s Economic Development Corporation is one of those agencies named. A spokesman noted that FreshDirect will invest more than $90 million in its move to The Bronx, which the agency said would stimulate the local economy. "A small group of critics continues to ignore the facts, including the enormous economic impact this project will have on an area that desperately needs jobs," said EDC spokesman Patrick Muncie. FreshDirect said Wednesday that its new facility would eventually create up to 1,000 jobs and provide more healthy food for Bronxites. “It's unfortunate that this small but vocal group is trying to deny local residents the jobs and benefits FreshDirect will bring to the Bronx,” the company said in a statement. FreshDirect also noted that it plans to roll out an all-green delivery truck fleet within five years, which will include 10 electric trucks it has already purchased. And it added that the new facility could generate more than $250 million in tax revenue for the city over 25 years. The company recently announced it would deliver to all Bronx zip codes and will accept food stamps from some online customers in a pilot program. Critics previously had slammed the company for building its facility in a neighborhood where it did not deliver.